Quantum networks: Back and forth are not equal distances! Quantum technology based on light (photons) has great potential for radically new information technology based on photonic circuits. Up to now, the photons in quantum photonic circuits have behaved in the same way whether they moved forward or backward in a photonic channel. This has limited the ability to control the photons and thus build complex circuits for photonic quantum computers. 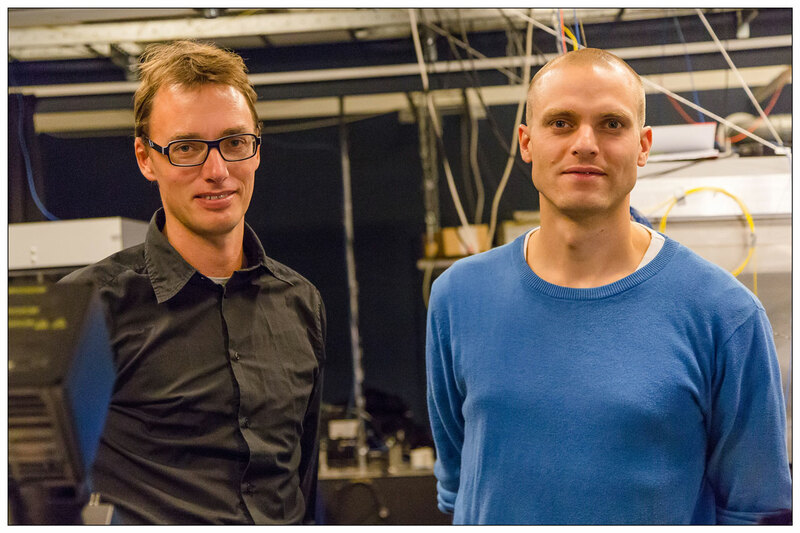 Now researchers from the Niels Bohr Institute have discovered a new type of photonic channels, where back and forth are not equal distances! Such a system has been a missing component for building quantum photonic circuits on a large scale. The results are published in the scientific journal, Nature Nanotechnology. “The smallest component of light is a photon and photons are very well suited for carrying information. A quantum circuit based on photons could contain far more information than is possible with current computer technology and the information could not be intercepted en route. So we are working to shape the future quantum technology based on photonics,” explains Peter Lodahl, Professor and head of the research group Quantum Photonics at the Niels Bohr Institute at the University of Copenhagen. 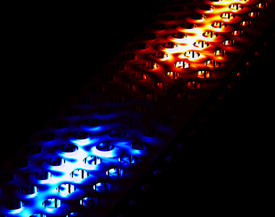 Researchers at the Niels Bohr Institute have developed a photonic chip, in which a light source – a so-called quantum dot – is embedded. By shining light on the quantum dot using a laser, its electrons are excited, which then jump from one orbit to another and thus emit a single photon at a time. Light is normally emitted in all directions, but the photonic chip is constructed so that all of the photons are sent out through a photonic channel. So far so good. But the problem is that the photons are sent in both directions in the photonic channel and this limits the efficiency of the light source. This is a problem that grows, the bigger and more complex the circuit becomes. Directional emission of light. The figure shows the calculations of the photon emission in the new directional photon source. If the spin of the electron points up, the photon is emitted in one direction (blue). If the spin of the electron points down, the photon is emitted in the opposite direction (red). (Credit: Sahand Mahmoodian and Søren Stobbe, NBI). 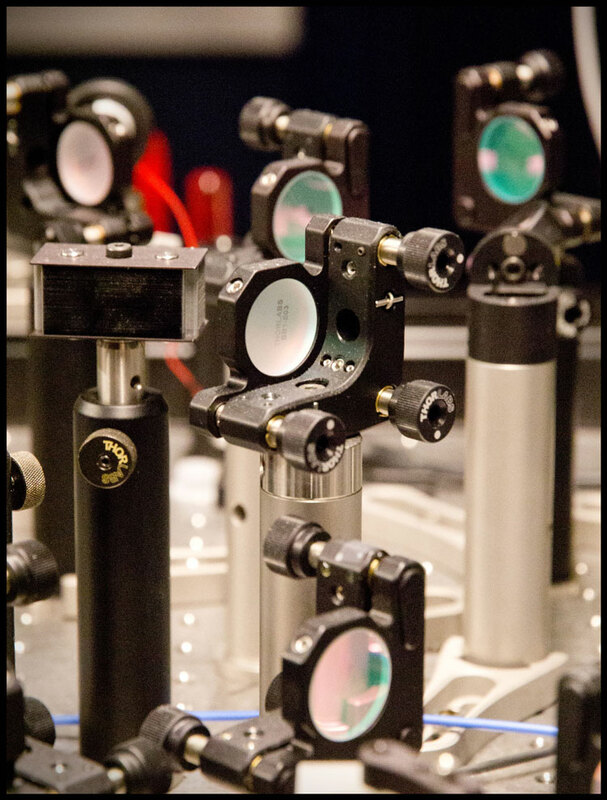 “In our work to resolve the problem, we have now developed a new photonic channel where we can control the photons so that they are only sent in one direction. 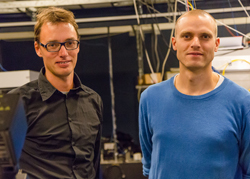 It is a fundamental new discovery, that you can get the emission of light in a photonic chip to take place in a manner not previously thought possible,” explains Peter Lodahl. 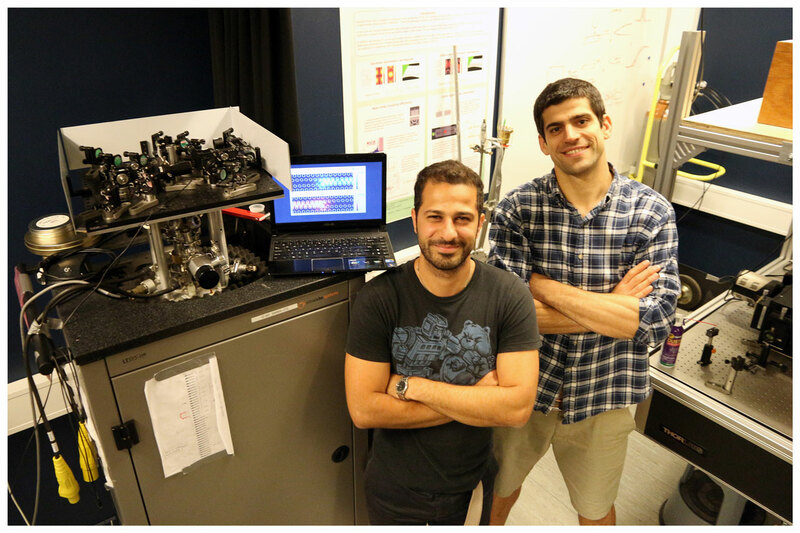 Immo Söllner and Sahand Mahmoodian, both postdocs in the research group Quantum Photonics, have worked with both the theory and the experiments. They explain that they use laser light to excite the quantum dot’s electrons, which jump from one orbit to another and thereby emit a single photon. By controlling the spin of the electrons with a magnetic field, you can get an entirely different light emission. A photon emitted from a quantum dot with an electron “spin down” chooses one direction, while the photon from a quantum dot with an electron “spin up”, chooses the opposite direction. 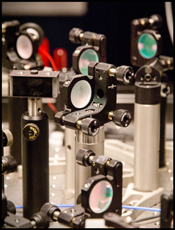 The experiments with quantum technology based on light (photons) are carried out in the Quantum Photonics laboratory at the Niels Bohr Institute in Copenhagen. 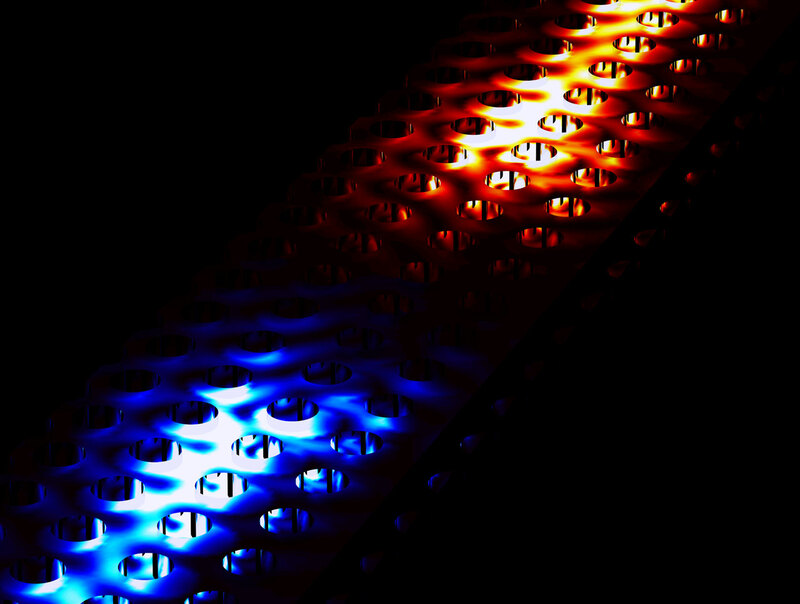 The most exciting thing about the new photon channels is perhaps not even that the direction of the light emission depends on the spin of the quantum dots. It also turns out that a photon that enters from one end of the channel behaves differently than a photon that enters from the other end. Only when the photon moves in one direction does it interact with the quantum dot and this slows the photon a little bit, just as if the photon had travelled a little farther. In this system, back and forth are therefore not equal distances! And unequal distances are not unimportant, but on the contrary, extremely important. “The photon is delayed a bit because it interacts with the quantum dot. We now have a number of new opportunities to control and design the interaction between a photon and a quantum dot, which is important for the development of quantum computers,” explain Immo Söllner and Sahand Mahmoodian. 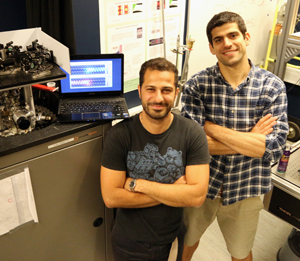 Sahand Mahmoodian and Immo Söllner, Postdoc in the research group Quantum Photonics at the Niels Bohr Institute. Søren Stobbe, who is an associate professor in the Quantum Photonics group at the Niels Bohr Institute, has led the production of the new light sources that has been developed in collaboration with Professor Jin Dong Song’s research group at the Korea Institute of Technology, and he adds that the new technology has the great advantage that it is based on the same semiconductor materials known from the computer industry. This means that the path from the laboratory to application is the shortest possible, although the researchers themselves estimate that it will require significant investment. “We can control the state of the quantum dot and thereby determine the direction in which the photon is emitted and whether the light, which moves in one direction or the other, needs to be delayed. This is a completely new functionality that will have some practical advantages when we start constructing quantum networks, which are expected to have great potential for calculating difficult problems in chemistry and materials technology. Therefore, we have patented our discovery and are working towards commercialisation,” says Professor Peter Lodahl.